I’m back! And just as I said, I didn’t post anything during my America trip. So now I’m working on a bunch of different things that I hope to post during the next few weeks – some songs, some stories, some things about Sheesania, and, of course, that mammoth review of Mistborn: The Final Empire. (It’s currently 3,155 words long and I’m only halfway through my outline. Ouch.) But for now, we have a calendar system. I’ve developed one other Sheesanian calendar before – the Thomoraii calendar, with its system of interlocking solar months and lunar months. This Arandui calendar is similar in how it uses both the solar year and the lunar year, but it has an added twist – the calendar is very closely tied to the practices of the Arandui church. Then some of these Egeldish peasants converted to Schesianism and eventually moved to Arandu. Their new settlements were still farming communities, in need of the agricultural calendar…but now they were also religious communities, in need of a religious calendar, too. So the Arandui church added several new quirks to the calendar, creating a system that’s a little more complicated but is useful for both farming and religious activity. Since this calendar is pretty accurate and most of Arandu is still Schesian, Aranduis continue to use their calendar today, even though most of them aren’t farmers anymore. Now let’s look more closely at the actual structure of the calendar. It takes Sheesania about 411 and 2/3 days to go around its sun – or in other words, its solar year is about 411.67 days long. The moon Wisaan, however, takes 29 days to complete a cycle, so there are 29 days to the month according to this moon. Unfortunately, the 411.67-day solar year clearly doesn’t match up nicely with these 29-day cycles. So the Arandui calendar defines a year as 406 days, split up into fourteen 29-day moon months. Then every three years, the calendar adds an extra fourteen days in order to make up for the 4.67 days lost each normal year. So basically, every year has fourteen 29-day months, with every third year adding 14 leap days to the end. Every three-year cycle is called a cataruus. The Arandui calendar has two other basic features – weeks and seasons. The Schesian religion calls for people to work for 6 days and then rest on the 7th day (yes, the Schesian religion is a form of Christianity, the explanation for this is forthcoming), so the calendar also divides the year into 58 seven-day weeks. Finally, the calendar splits the year into two seasons – the first half of the year (the first 203 days/29 weeks/7 months) makes up the dry season (which is also cold), and the second half makes up the wet season (which is warm). A normal year will have 2 seasons. Each season will have 29 weeks. Each week will have 7 days. Each season will have 7 months. Each month will have 29 days. In addition to all the categories I talked about above, the Arandui church organizes time as a cycle of nine repeating phases representing various times in the history of the church. Each phase is either a celebration phase or a mourning phase. There are four pairs of celebration/mourning phases, then a central celebration phase, then another four pairs, this time of mourning and then celebration. Here they are, in order. All of their Arandui names are borrowed from the Arandui holy language (I’m not sure yet on the details of what exactly this language is, but it’s probably a variety of the Ner language spoken in Bodia), except for Taas and Entahier, which are native Arandui words. Each phase takes up two lunar months in the calendar, but because there are 9 phases and only 14 months, the church phases and a year of the calendar don’t match up exactly. Instead, after a year has begun with the first phase, Námadyai, it takes nine years for the church phases to complete a cycle and then start a new year again with Námadyai. One nine-year cycle is called a haelce. By the time a complete haelce is finished, each phase will have started on every odd month of the year. Years 2-5 all start on mourning phases, and years 6-9 and 1 all start on celebration phases. So because Aranduis evidently love to organize things and give them lots of names, years 2-5 of one haelce are called its dry season, and years 6-9 and the first year of the next haelce are called its wet season. So you could say that it’s the Ozraish year of the 50th haelce, or to be more vague you could say it’s the dry season of the 50th haelce. Or you could just say it’s the 50th haelce. Lots of options! The Arandui church observes special ceremonies at the beginning and end of every phase, and each one has its own special starting and finishing ceremonies. There are also many other rites and rituals throughout the year that change according to phase. So, for instance, if you’re currently in a mourning phase, you would mostly sing songs calling on God for help when you’re singing in a church service. But if you were in a celebration phase, songs of thanksgiving would be more frequent. In addition, the church celebrates special holidays on the extra weeks added to the end of every third year. The first set of extra weeks in a haelce falls during a Śúdyai (Birth of Jesus) phase, and they’re used to celebrate the life of Jesus; they’re called the weeks of Cúesdyai. The second set of leap weeks in a haelce, the weeks of Tavoraci, falls during a Jóladyai (Persecution) phase, and there’s a special holiday in these days to celebrate the journey of Egeldish believers to Arandu after the persecution. The final set of leap weeks, the weeks of Naas, falls during a Páladyai (Redemption of the Universe) phase. Part of the celebrations during these weeks look forward to heaven, but there are also many celebrations for the beginning of a new haelce. 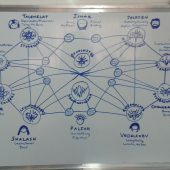 Finally, here’s an Arandui-style calendar of the current haelce, marked with everything I talked about. The numbers note the number of the week in the year, and the turquoise-shaded days are rest days. This entry was posted in Encyclopedia, Enter Sheesania, Miscellaneous. Bookmark the permalink.